The Stars and Stripes is recognized the world over as a symbol of Freedom. 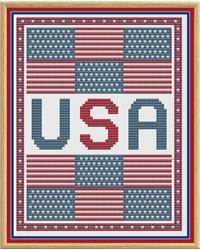 I designed this while living in the US, and wanted to share my new found patriotism with the stitching world. There are only 3 colors in this design, red, white, and blue. The design comprises whole stitches only with no backstitch, and the pattern is suitable for all abilities, especially beginners. Project Size: 5" x 6"